Levare may have just been completed, but Santana Row is already gearing up for their next project. 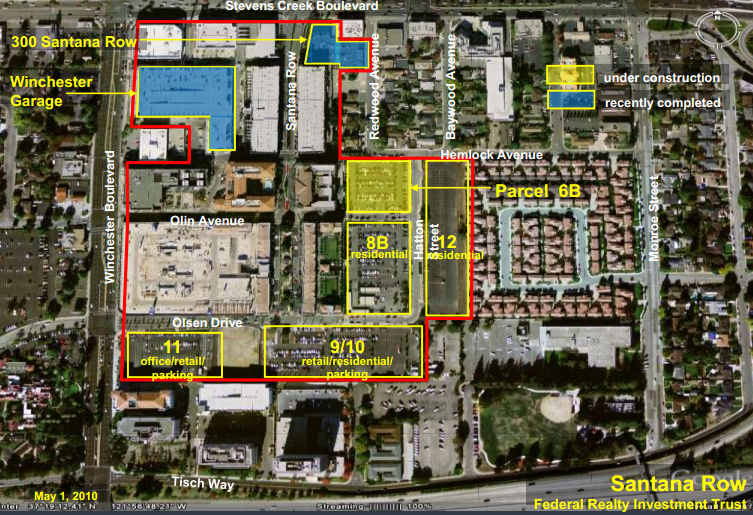 The plan is to build over 200 luxury rental homes by fall 2013. The construction area will be the lot behind Diesel and Pasta Pomodoro, also known as Parcel 8B. If you look at the image below, you can see after this there are still 3 other parcels to develop. 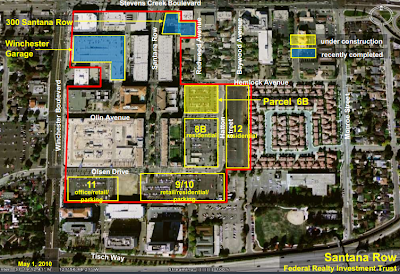 I'm hoping that one of those will be used for at least a mid-rise and they'll add some more retail to the Row (as indicated on parcels 11 and 9/10). Thanks to the guys from the San Jose development forum for this info. Also, here is a PDF of the information sent out to residents and employees. This is a real pain for those who live at the ROW! They moved our parking really far from our entrance to the building and the dust from the construction is also a major issue as my car parked a block away is covered in dust daily as well as my townhome needs to be dusted daily costing me around an extra 400 a month for carwash and maid service Greed is what I would call this development~upon signing the lease no word was mentioned about the project, NICE!